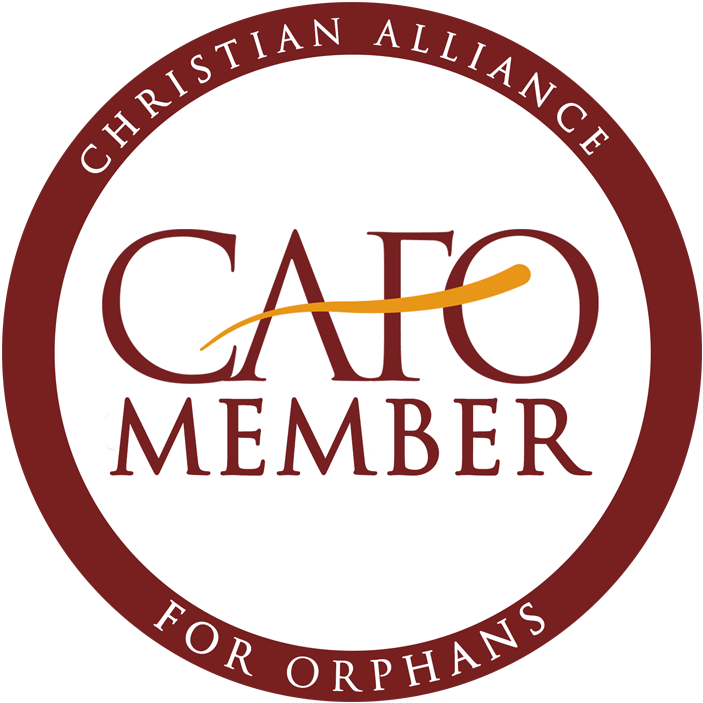 This page includes the profiles of those children with more than $2,500+ in grant funding available. Put on your WARRIOR shoes and help us find families! 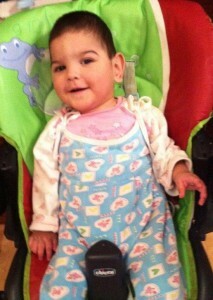 PLEASE SHARE THIS PAGE, that others will see it and take that leap of faith to save a child in need. Ezrah can keep his head steadily and can hold his head up; he can stand up with wrists held slightly; he can recognize the aunt who cares him, can make sound of ma-ma, nai-nai, can shake and stare at the rattles, can take a block in a hand and take another one, can reach and grasp the toy beyond, and can shake the rattles consciously; he can chase the toy with hands and can look for the dropped toy; he can react to the game of hide and seek and looking oneself in the mirror; he is very curious and likes to discover and recognize all kinds of never seen objects and fresh things. He cares about the changers of around people and things. Ezrah has an extroverted personality, is active, likes to play games with peers; he likes colorful toys with making sounds; he responds actively to stimulation of new things or strangers. 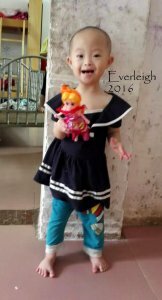 April 2016 update: Ezrah is active and outgoing. Ezraht’s mental development is the same as kids the same age. His lower limbs make it so that he cannot walk. He knows and will tell adults when he needs to go to the bathroom. He can use the baby toilet by himself. Ezrah is well behaved and obedient. 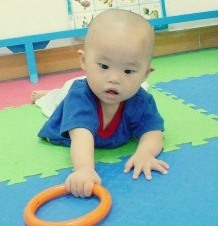 He cannot walk, but he can move on his bottom with hand coordination. His fine motor skills are good and he can pick up rice. 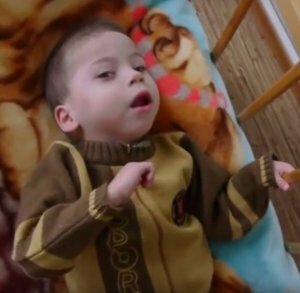 He cannot go to school due to his special need. Ezrah has good emotional development. He can read faces. He is attached to his foster mother and will share food with her. Ezrah can express his needs well and can follow simple directions. He is a very smart child! He can call the familiar people properly. 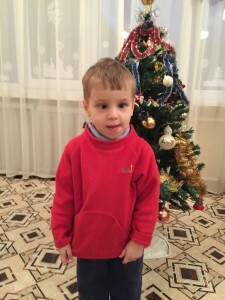 Ezrah likes to play games with his foster family and other kids. He has been in the same foster family since March of 2014. He is not on any medication. $3,457.60 has been donated towards the cost of my adoption! Shannon is an outgoing girl who loves to talk! She may only be able to say simple words but she can be the life of the party. 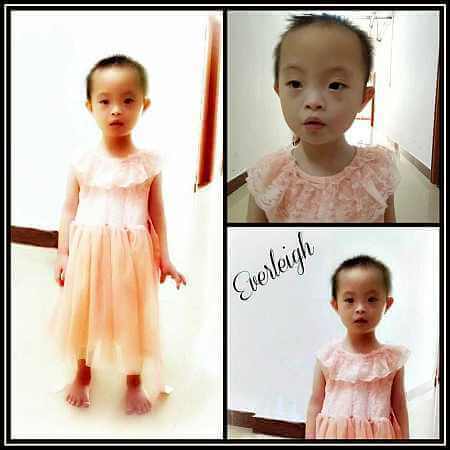 She has been diagnosed with Down syndrome and has two mild heart defects (an ASD and a VSD). She is also a Hep B carrier. 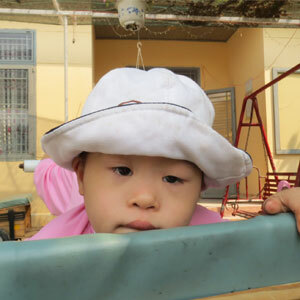 Shannon’s caregivers say that she lives life just like the rest of her friends in the orphanage. She loves to eat, play, and watch cartoons. 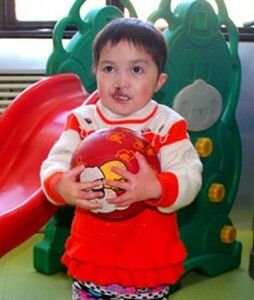 Shannon is always playing and smiling! UPDATE: Rule number one…never leave scissors out where Shannon can get them. She currently has little to no bangs due to an attempt to style her own hair. 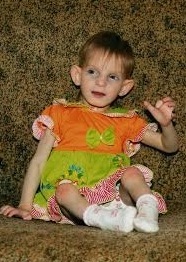 However, even a bad haircut can’t take away from Shannon’s sweet spirit and lovable personality! She is currently 5 years old, and waiting very patiently for her mama and papa. 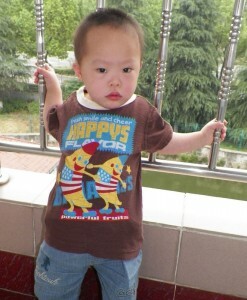 Shannon has Down syndrome, an ASD and VSD (which have not been repaired) , and is a HepB carrier. 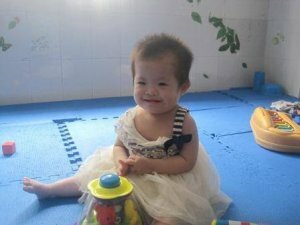 Shannon came to the orphanage at about 7 months of age, already able to sit and crawl. She has good motor skills, but needs help with her speech. Her receptive speech is good, and she follows directions. Shannon can use 3 word sentences. Shannon is a sweet and huggable girl who is very curious. 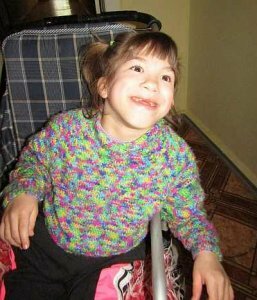 She loves to play with her friends, and thrives in a noisy environment. 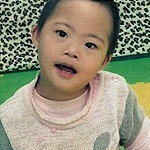 Shannon is ready to be part of a loving family, who will help her reach her full potential! Video is available. $2,636.34 has been donated towards the cost of my adoption! 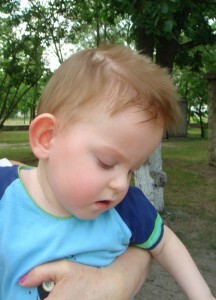 Olivier is diagnosed with down syndrome and a partial left hand. 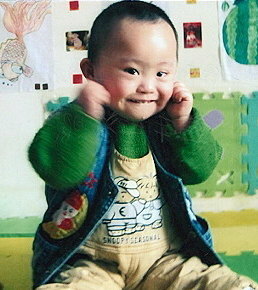 He lives in a foster family on the grounds of the orphanage and participates in the Infant and Parenting program. His report describes him as extroverted, active, and energetic. He likes to communicate and play games with children. 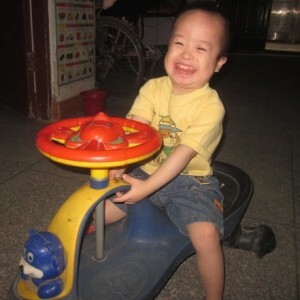 Olivier’s favorite activities are playing with blocks, balls and riding bike. He can walk, can transfer positions when squatting, he can kick the football, go upstairs and downstairs with hands held. He can build a tower of 4 blocks, can dismantle the toy and assemble it again. He is very clever and can express his needs. 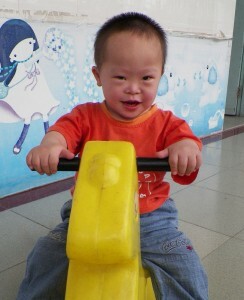 An orphanage project team visited with Olivier last summer. $4,909.60 has been donated towards the cost of my adoption! 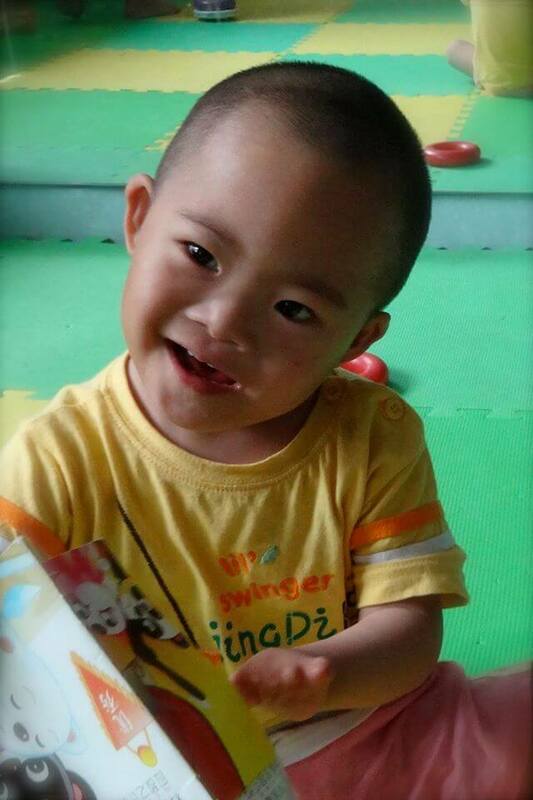 Brychan is an outgoing boy who has a ready smile and likes to play with other children. 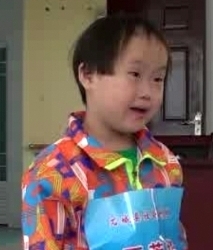 He is diagnosed with down syndrome. Brychan is described as a very happy child. He understands simple instructions and follows directions well. 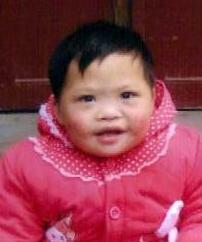 Brychan lives with a foster family on the grounds of the orphanage and participates in the Little Sister program. 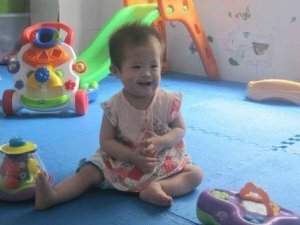 An orphanage project team visited with Brychan last summer. $3,185.80 has been donated towards the cost of my adoption! 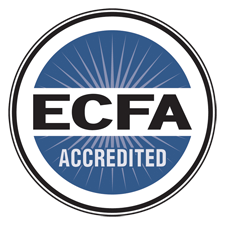 Ezra has had a shunt placed, and is doing better. 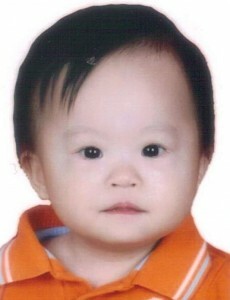 His adoption may necessitate consultations with medical personnel, to safely transport him home. From someone who met Ezra in 2013: Ezra is absolutely precious! He is sweet and adorable and oh so lovable! 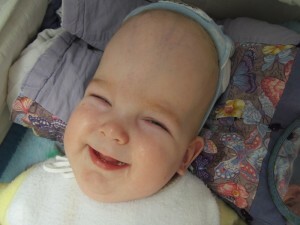 He laughs when his toes are tickled, or when someone around him laughs or talks or sings to him. He often smiles or laughs so hard his chubby cheekers make his eyes close. He ha s learned to blow spit bubbles and coo. 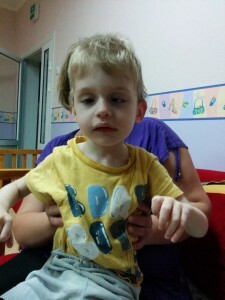 It is hard for me to tell if he is able to use his limbs normally, but he is able to move from his back to his side with little or no assistance. 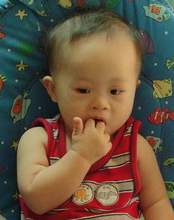 He has not yet learned to play with toys, but he has a very strong grip and enjoys holding my finger. I was told he can see, but not very well. I observed his eyes moving rapidly from side to side, and sometimes appearing to be looking in two different directions. In spite of this there were other times in which he appeared to be quite focused and looking right at us. He has absolutely stolen my heart, and I hope that he will find a family that can help him meet his full potential! These pictures are from May, 2013. $4,051.32 has been donated towards the cost of my adoption! 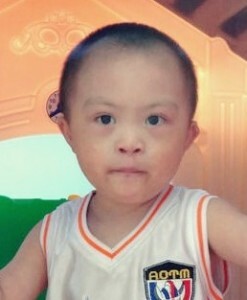 Little Mr. Stanley is stated to have good development for a child with Down Syndrome. His given name in Chinese means beautiful and glorious which is a perfect match for this incredibly handsome boy whom I am sure will grow up to do glorious things. $2,739.31 has been donated towards the cost of my adoption! $4,830.80 has been donated towards the cost of my adoption! 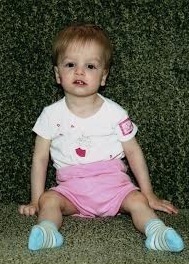 Shaw was abandoned at the age of 6 months. 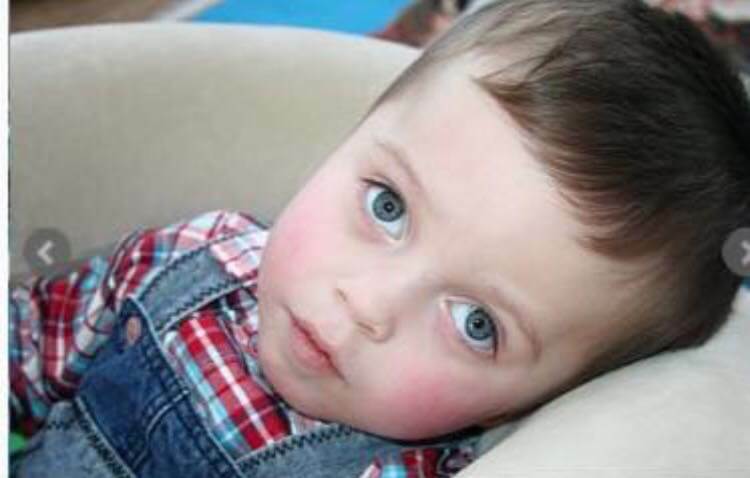 When he was found he could crawl and he initially made progress, but by the time he was 16 months old and was sent to a foster home, he was very thin and weak. After a few months in foster care he began to thrive again. Shaw loves to eat and shows patience in all areas except when he has to wait for his food! He gets along well with others and loves bright colorful toys that make sound. Shaw is very talkative and loves to be cuddled! He is waiting for a family that will snuggle with him and help him continue to grow. $2,520.55 has been donated towards the cost of my adoption! 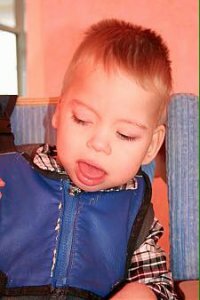 Peter is a precious 3 year old boy diagnosed with Down’s syndrome, congenital nystagmus, and polydactyly of the right hand. 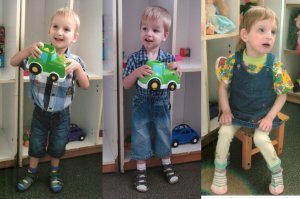 His limb, language and intelligence development is fairly delayed compared to his peers. 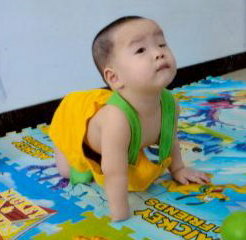 At the age of 1, he could crawl slowly and sit alone, and make sounds unconsciously. 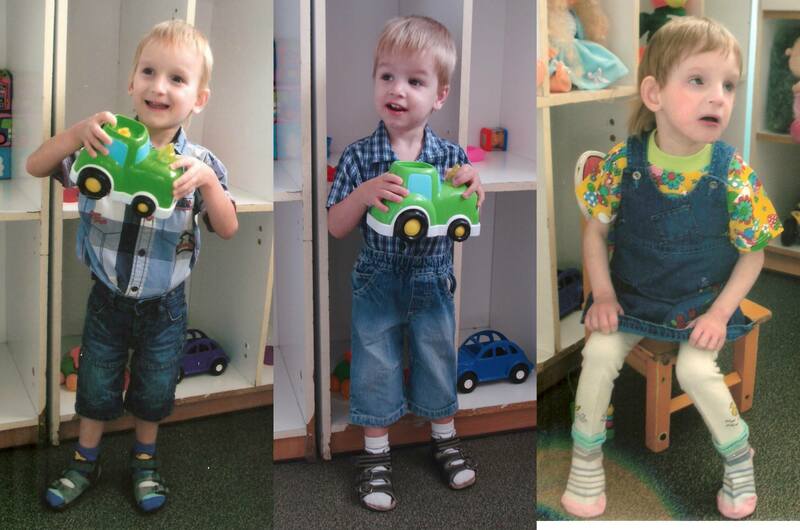 At age 2, he could stand while holding onto handrails and could walk with one hand held. He could also understand simple instructions such as “come here” “sit down” and “drink milk.” Now, he can walk steadily, run slowly, and go up and down the stairs while holding onto handrails. He can eat a biscuit by himself and is even practicing eating with a spoon. 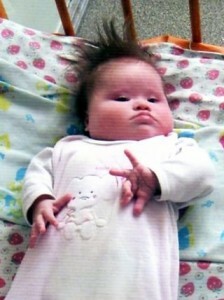 He can imitate monosyllables and can understand most daily conversations of adults. 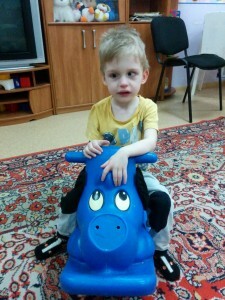 He is very interested in games and toys, and likes to play with others. Peter is a quiet boy who always has a ready smile. He gets along well with the other children and likes playing outdoors. $4,132.25 has been donated towards the cost of my adoption! 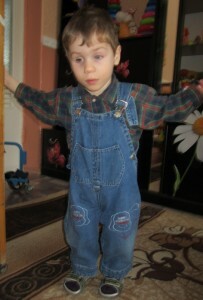 His overall health is good; he is currently in a foster home. 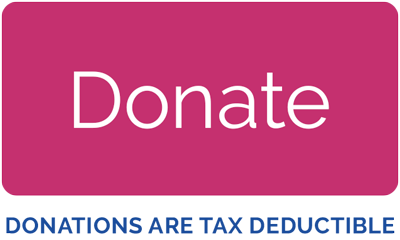 $2,856.00 has been donated towards the cost of my adoption! 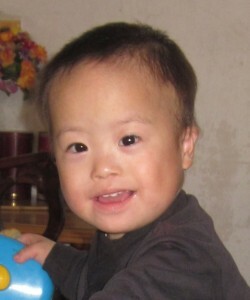 Brody is a sweet little boy who has been diagnosed with Down syndrome. 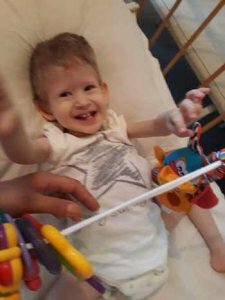 He also has a heart defect in which he received surgery for his VSD, foramen ovale closure and ligation of ductus arteriosus. His treatment was successful and he is doing well now. Brody is learning well and is he learning how to crawl. He can hold his own bottle and toys and likes to be active. He is not making sounds yet but he always has a ready smile. $4,582.62 has been donated towards the cost of my adoption! 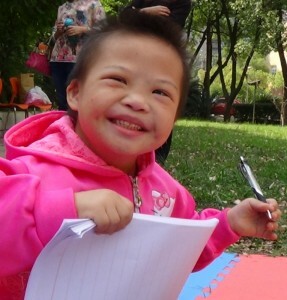 This DARLING gift was born and left abandoned outside an apartment building. 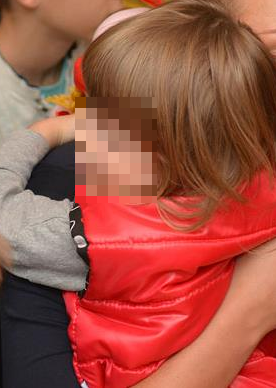 Authorities were never able to locate his parents, but thank God they found him! 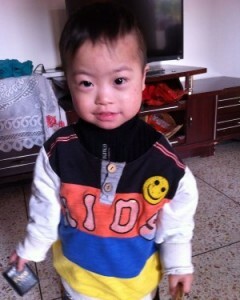 David has been living in an orphanage with outstanding medical care and lots of attention and love. 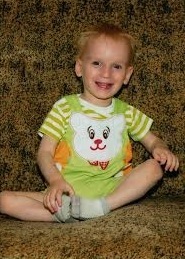 He is so young, and will benefit so greatly from further early intervention and a loving forever family. Full medical records, social history, and more photos available. $3,622.59 has been donated towards the cost of my adoption! 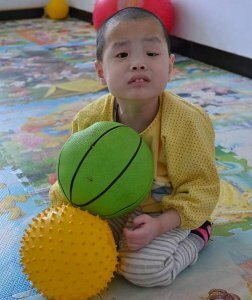 This sweet boy can follow his daily routines and has preferred friends and adults at his care center. 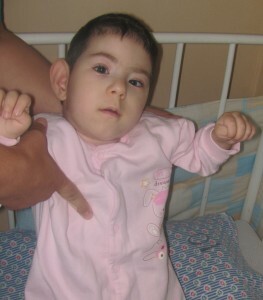 Upon coming into care after being found, he was noted to have no right hand, a right leg that was longer and weaker than the left, and to have Down syndrome. His health has reportedly been good. He loves striking two things together to make sounds and climbing. 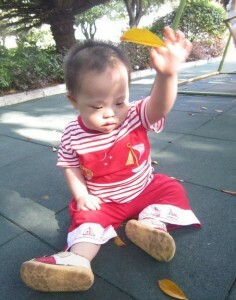 His development is delayed but his gross motor skills are emerging. 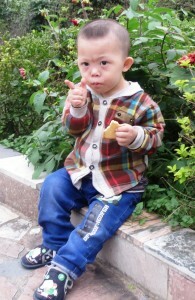 Recently he has shown improvements in learning to listen and expressing his emotions when upset. 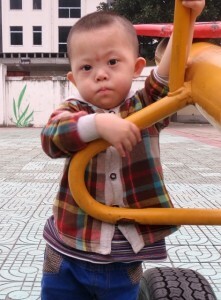 This boy is waiting for a family with the resources he needs to reach his full potential. $4,687.60 has been donated towards the cost of my adoption! Will be available September 2016! Joey is a tiny, smiley little guy who loves attention and hugs! He was so happy to sit on my lap for a hug, to show me the little stuffed animal and toys he was holding and to have his picture taken! He is verbal and said things like, “Cheese!” when having his picture taken, and “Can I see?” to see the photo stored in the camera. 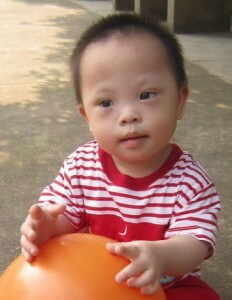 He will make a sweet addition to any family and he will simply thrive with the love of a Mama and Papa poured into him! He is in the same place as Chester and Byron – the last three orphans left in their institution. $3,107.55 has been donated towards the cost of my adoption! $2,527.56 has been donated towards the cost of my adoption! Elsa is just adorable! She is incredibly charming, and sweet. 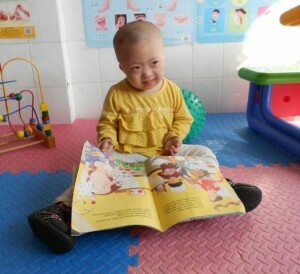 Elsa has Down syndrome with the expected delays, but was walking at 2 years old. She has no known heart issues. She lives with a foster family, who have made sure she has a good diet, plenty of fresh air, and all the hugs she wants(she likes warm hugs)! Elsa is ready to let it go and have a family of her own and will waste no time in wrapping them around her little finger. $3,441.73 has been donated towards the cost of my adoption! Lee is extremely intelligent. He currently attends class in the little brothers and sisters class. In class, he is learning art and dance. Lee likes to watch cartoons. He will laugh while captively watching them. 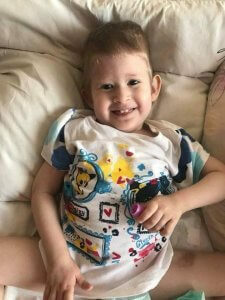 If you play with him and poke his tummy with your fingers, he will grab his shirt and pull it up; he will then quickly pull it back down to cover his tummy, not letting you see it. His eyes will look slyly at you and then he will secretly laugh. Lee is very intelligent. Even though he is unable to clearly express his own thoughts verbally for the time being, his body language abilities are extremely strong. He can use his hands to signal to you “Greetings”, “Thank you” and other types of movements. Lee is really adorable and intelligent. He is an extremely charming little boy. 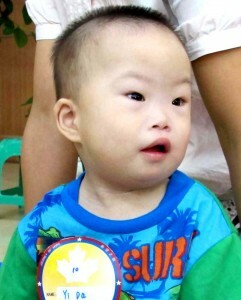 Help us find Lee’s forever family! $2,713.50 has been donated towards the cost of my adoption! Blake just turned 4 years old! Since last summer he has been living with a foster family and this year he started kindergarten. 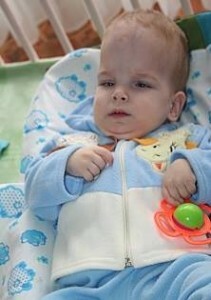 Blake still needs daily help from his caregivers, but he is trying to do more for himself. Even though he is still a little delayed, he can go up and down the stairs all by himself and has good basic fine motor skills. 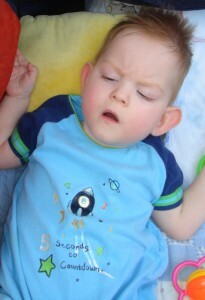 Blake can understand what his foster family says to him but sometimes they cannot understand his words clearly. He enjoys playing with the other children. Blake is always energetic and tries to keep a ready smile for the day! $2,523.05 has been donated towards the cost of my adoption! What a sweet baby Elias is! Elias is in a fast region that often waives the 10 day wait. $2,871.25 has been donated towards the cost of my adoption!